Imagine for a moment that it’s 40,000 years in the future in a solar system far, far, away on a planet thriving with intelligent life. Extraterrestrial beings inhabit this place. Perhaps they look like the cuddly ET, the blob, ALF, or maybe even like the dreadlocked beings from Predator; but either way, they are not human. An approaching speck in space catches the beings’ eyes (assuming they have them). Upon sending a craft to retrieve it, they find a probe containing a disk. Using instructions on the disk, they manage to play it. What they are about to hear and see are the sounds and images from an ancient alien civilization – 1977 Earth. Flashback about 40 millenia to Cornell University in Ithaca, New York, Earth in January, 1977. A brilliant, 43 year old professor named Carl Sagan is the director of the Laboratory of Planetary Studies there. In 1975, he had won the Pulitzer Prize for his book “The Dragons of Eden,” a dissertation on the evolution of human intelligence. He helped shape the field of exobiology, the study of the potential for life on other planets. Sagan had also been a key adviser for NASA dating all the way back to it’s earliest days. Working out of the Jet Propulsion Laboratory in Pasadena, California (the same place that Georges Lemaitre spoke with Einstein in 1933 and where Jack Parson launched the first rocket in 1936) as a visiting scientist, he helped design and manage several space exploration missions, including the Mariner 2’s trip to Venus and Viking one & two’s trips to Mars. Also, in the late 1950s, he was involved in a plan the U.S. had to nuke the moon. So, when Dr. Sagan received a call to come to the JPL once again to help NASA, this wasn’t out of the ordinary. But this wasn’t an ordinary mission. In August of 1977, NASA planned on launching twin unmanned space probes called Voyager 1 & Voyager 2. The probes’ original mission was to explore and take pictures of the giants of our solar system, Jupiter, Saturn, plus all of their moons. There was also a hope that if the probe’s instruments continued to operate, the probes could do the same with Uranus and Neptune. Due to “a rare geometric arrangement of the outer planets” that only happens every 175 years, all four planets were positioned perfectly so that a probe launched into space at the proper angle, time, and speed would be able to pass all of them. Pluto was never part of the mission due to it being elsewhere in its orbit and not part of this geometric arrangement. The probes were built to last five years, but there was considerable optimism, that has since proved founded, that they would last many years more. There was also a possible additional mission- if all went as planned and they were able to carry it out, they would be the first Earth crafts to leave our solar system and become interstellar travelers. This is what NASA wanted Dr. Sagan for. In less than nine months, NASA wanted Dr. Sagan to compile a team and devise a message in case of contact with an extraterrestrial civilization outside of our solar system, a message that needed to convey what life was like on Earth and be relatively easily understood by those who receive it. Now, the chances of the probes ever being found, detected, or recovered by an extraterrestrial civilization are incredibly small. The probes are the size of a small car which doesn’t even register as a blip in the vastness of the universe. For that matter, the Milky Way itself is barely a blip on that scale. Additionally, the probes wouldn’t even reach another planetary system until around 40,000 years into the future. At that point, Voyager 1 will be nearing Gliese 445 and Voyager 2 will be close to Ross 248. Nevertheless, it was decided such a message should be included, just in case. The decision was made pretty early on that whatever was sent up there needed to showcase Earth – the sights and sounds of our home planet. It had to be a “cultural Noah’s Ark with a shelf life of hundreds of millions of years.” Now, the question was what sights and sounds exactly? To answer this question, Dr. Sagan compiled his team. Dr. Frank Drake worked with Sagan on the Pioneer plaque in 1972, which among other things included the location of Earth, mapping it out via pulsars. Ann Druyan was a friend of Sagan’s (later, his wife) and a young scientific novelist. She was put in charge of music selection. Timothy Ferris (at the time, engaged to Druyan) was a writer for Rolling Stone and would go on to become “the best scientific journalist of his generation.” He helped picked the images that were to be included. Jon Lomberg had already been Dr. Sagan’s artistic collaborator for several years; his job was to bring color and artistic beauty to what the interstellar beings would see. Finally, there was Linda Sagan, Carl’s wife. She had created the artwork on the Pioneer plaque and was to help produce this project. Their first order of business was to figure out how they were going to convey this message. The receptacle for this kind of message had to last for thousands of years and be simple to play. Drake suggested the old-school technology of a phonographic record. It was rather simple to play and as long as the physical record itself was protected, it wouldn’t erode over time. The etchings on a metallic phonographic record could last, according to estimations, for hundreds of millions of years with very little degradation. Additionally, they decided to make it a copper disk coated in gold, further protecting it from magnetic fields and heat, as well as placing it in a protective aluminum jacket. Coupled with an included needle and cartridge, an alien civilization would be able to play it. They also decided to design it to run at 16 2/3 revolutions per minute, as opposed to the normal 33 1/3 revolutions. This was done so that they could jam as many pictures, music, greetings, and information as they could onto the record. In order to make sure the aliens knew what to do with the disk, needle, and cartridge, symbols were etched in showing how it was to be used. For instance, to make sure they know what speed to rotate the record at, this is etched in binary arithmetic expressed as a factor of the fundamental transition of the hydrogen atom. In order to demonstrate how the pictures are to be decoded and viewed, the upper right portion of the cover shows the analog signal that is the start of the picture, and in binary how the first three vertical lines are marked. They further show how many vertical lines to a picture. On the face is also a carefully chosen picture of the first picture on the record, for calibration purposes. Next, and possibly the most arduous task, was to determine what exactly would be on this record. The team wanted the golden record to represent what life was like on Earth; the sights, sounds, and feelings we encounter everyday. After much deliberation, 115 images encoded in analog form (including a picture of DNA, human anatomy, Olympic sprinters, an African hut, and a diagram of vertebrate evolution) and an audio “track list” with greetings, sounds, and music were included. The next audio section was known as “sounds of Earth.” They included things like a baby crying, a volcano erupting, birds calling, and a train roaring past. The last audio section was the music, overseen by Ann Druyan. Among the tracks selected for this section was Beethoven’s Fifth Symphony, a Pygmy girls’ initiation song from Zaire, Peruvian panpipes and drums, and “Johnny B. Goode,” by Chuck Berry. Noticeably absent was any song from the Beatles. While the band wanted their hit “Here Comes the Sun” to be included, they didn’t own the rights to their songs. Their publishing company, EMI, did and they did not allow it to happen. 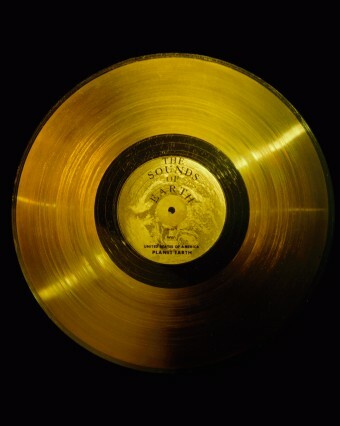 For everything the team included on this golden record, probably the most unique – and telling – inclusion was an EEG brain scan of a young woman, newly in love. That woman turned out to be Ann Druyan. Druyan had planned on going through “a mental itinerary of the ideas and individuals of history whose memory I hoped to perpetuate,” as well as thoughts of her fiancé Tim Ferris while being connected to the EEG. But two days before the recording, something extraordinary happened. She fell in love with Dr. Carl Sagan. Two days after our life-changing phone call, I entered a laboratory at Bellevue Hospital in New York City and was hooked up to a computer that turned all the data from my brain and heart into sound. I had a one-hour mental itinerary of the information I wished to convey. I began by thinking about the history of Earth and the life it sustains. To the best of my abilities I tried to think something of the history of ideas and human social organization. I thought about the predicament that our civilization finds itself in and about the violence and poverty that make this planet a hell for so many of its inhabitants. Toward the end I permitted myself a personal statement of what it was like to fall in love. On August 20, 1977 Voyager 2 lifted off into space. Voyager 1 joined its twin 16 days later. Over the next four years, they explored and took snapshots of Jupiter and Saturn. In 1986, Voyager arrived at Uranus. By 1989, it had passed by Neptune. Voyager 1 officially entered interstellar space on August 25, 2012 and as of February 20, 2014, it was 127.25 AU from Earth. The farthest away of any man-made object. With perhaps as many as 500 billion galaxies each with billions of stars (for reference the Milky Way has about 300 billion), many of which have planetary objects orbiting them, it seems likely enough we’re not alone in the universe. The Voyager probes will orbit the Milky Way indefinitely, so you never know. One of them might encounter an intelligent alien civilization, maybe even long after humans have gone the way of the Dodo bird. The spacecraft will be encountered and the record played only if there are advanced spacefaring civilizations in interstellar space. But the launching of this bottle into the cosmic ocean says something very hopeful about life on this planet. In order to allow the recipients to view certain images in color, three consecutive images were used in these cases, each representing red, green, and blue. In order for them to determine whether they are calibrating it correctly, a picture of our sun was included. Using the pulsar map to locate it, the aliens should be able to directly compare our sun’s exact color (which isn’t yellow by the way) with the image included. As one could imagine, despite the cute love story between Dr. Sagan and Ann Druyan, there were pretty dire consequences due to their secret marriage. They both decided not to reveal it to their partners until the project was completed. But when they eventually did, it led to a eight year legal battle between Carl and Linda, longer than it took the Voyagers to pass by Jupiter. Their was no ‘secret marriage’. They had a secret relationship, but Sagan was not a bigamist. Is Voyager the current fastest man made object? Sadly, 40,000 in the future the Voyager will not have even reached the closest star from us…… and that is merely about 4 light-years… but there’s always some chance albeit small, that the probe can be intercepted by aliens wandering out there….